Star NHL defender who received the Conn Smythe Trophy as the playoff MVP after leading the Chicago Blackhawks to a Stanley Cup Championship in 2015. 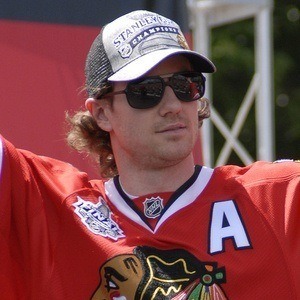 He previously helped the Blackhawks win Stanley Cups in 2010 and 2013, and he was honored with the James Norris Memorial Trophy as the league's top defender in both 2010 and 2014. He made his NHL debut with the Blackhawks in 2005 after playing collegiately for Michigan State University. He won Olympic gold medals with the Canadian national team at the 2010 and 2014 Games. He has two siblings, an older brother named Cameron and a younger sister named Rebecca. He married Kelly-Rae Keith and he has a son named Colton. Jonathan Toews took Conn Smythe honors the first time he and Keith hoisted the Stanley Cup together in 2010.